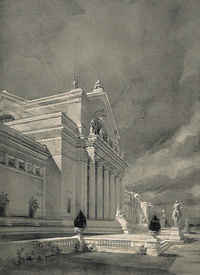 The Palace of Fine Arts was the exposition's only permanent building, and after the fair, it became the St. Louis Art Museum. Located behind Festival Hall, it was constructed of limestone and brick and featured two temporary wings, also constructed of brick, that created a 450-foot facade. More restrained in its design than Festival Hall, the Art Building derives from Classical architecture. Gilbert hired two of his favorite experts to work on the project: Gunvald Aus and Rafael Guastavino. 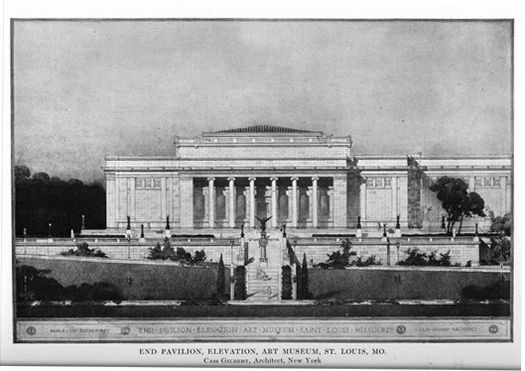 The close proximity of Festival Hall and the Art Building caused a legal battle between Gilbert and the exposition's organizers: Gilbert claimed he had designed two buildings and ought to be paid for two; the organizers considered the two structures one building. While presenting his case in court, Judge Lehman (not the judge hearing the case), who was one of the directors of the exposition company, expressed his sympathy for Gilbert's plight and also stated he was on the committee to erect a new public library. [CG to Julia Gilbert, March 30, 1905 LOC-CGP] Gilbert did win the St. Louis Public Library (1907-12), a prominent example of his remarkable ability to produce and maintain a loyal client base. The celebration marked the centennial of the Louisiana Purchase. The fair was attended by 20,000,000 people, but it did not capture America's hearts as much as the Columbian Exposition had. This is perhaps because the Columbian Exposition had stolen those hearts a decade earlier. Today, people's knowledge of the fair may rest more with the Vincent Minnelli movie that starred Judy Garland and the movie's eponymous song: "Meet Me in St. Louis." Copyright © 2001-2018 Cass Gilbert Society—all rights reserved.